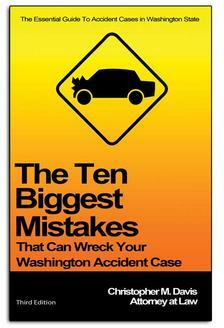 "...Mr. Davis truly should be commended for this service to the community at large..."
"...in my opinion this pithy book [The Ten Biggest Mistakes That Can Wreck Your Washington Accident Case] is brilliant in its simplicity, rich in its depth and an overall good and satisfying read. Mr. Davis truly should be commended for this service to the community at large and the Plaintiff's Bar particularly. Bravo!" "Chris and all his staff are amazing!" -Kevin K.